On the Bishop Street Methodist Church War Memorial there are the names and units of 23 men who died in World War 1 and whom the peace time congregation chose to honour. Other men from the 1914 congregation may also have fought and survived and others may have chosen to conscientiously object to conscription on religious grounds and served in other ways as non combatants. The present congregation have chosen to research and preserve the memory of the war dead, as these are the only names which have come down to us. 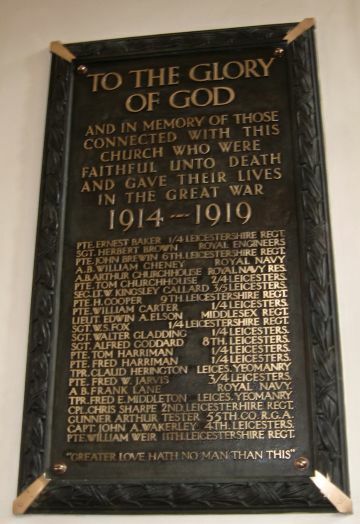 We do, however, honour the choices made by all the men connected to Bishop St Methodist Church who were eligible for service. The group of 23 men from Bishop St volunteered for service and saw action in the navy, on the Western Front and in Mesopotamia. Most were aged between 18 and 26, and many of them were Kitchener volunteers. Those who joined Leicestershire regiments fought and died in all their major engagements from 1914-18. For the most part they were young privates, corporals and sergeants, together with three officers, who did their duty as best they could in dangerous and hazardous circumstances, and in many cases against impossible odds. There are two instances of members of the same family, dying in the same year, within a few months of each other – the Churchhouse and Harriman brothers. Eight have official war graves and fifteen have their names commemorated on official war memorials in Leicester, Chatham, France and Mesopotamia. The following list in alphabetical order describes the circumstances of their death and as much of their pre-war life as it has been possible to reconstruct from research. Born April-June 1896 in Leicester. In 1911 he was living in 21 Albert St, Leicester and working as a wool hand. His father was born in Birmingham and worked as a gas stoker. His mother was born in Leicester, and he had five brothers and one sister. He was killed by a shell in the trenches. Commemorated on Ypres (Menin Gate) Memorial. This man was not local to Leicester and the only name, rank and unit that seems to fit in the Commonwealth War Graves record is that of Farrier Sergeant H. Brown of the Signal Service Training Centre, Royal Engineers who died on 29 November 1919 and is buried in St Helen’s Cemetery. His connection to Bishop St Methodist Church is unknown. Born Jan- March 1892 in Knighton, Leicester. In 1911 he was living at 55 Royal East St, Leicester and working as a button sewer. His father was born in Leicester and worked as a shoe hand, his mother was born in Dublin. He had three sisters and two brothers. He probably took part in the attack on Bazentin Le Petit Wood during 14-16 July 1916 and his death was recorded a day later. Four Leicestershire Battalions took part in this action during the Battle of the Somme which resulted in heavy casualties, with losses recorded from all over the county. Born March 13 1897 in Leicester, baptised at Bishop St Methodist Church 18 April 1897. He taught in the Sunday School at Bishop St, was a local Methodist preacher and intended to become an ordained minister. In 1911 he was still at school and living at 122 London Rd, Leicester. His father was a baker and confectioner born in Torquay, Devon. His mother was born in Ludlow, Shropshire. He had one brother and one sister. In 1915 he was awarded a scholarship in science by University College, Oxford and then signed up. He took part in the attack on the Gommecourt sector during the first day of the Battle of the Somme. He was killed by a shell in the trenches while waiting to mount a counter-attack. Buried at Foncquevillers Military Cemetery. Born April –June 1896 in Leicester. In 1911 he was living in lodgings at 97 Andrew St, Leicester with his family and working as a boots lasting room helper. His father, who was born in Stoke Albany, Northants and was a finisher in the boot and shoe industry, was absent, possibly dead. His mother was working as a shoe machinist, and he had a brother and sister. In 1914 he was living at 28 Ridley St, Hinckley Rd, Leicester. He was killed by a shell while in trenches in Rue Du Bois in France. Buried in Cite Bonjean Military Cemetery, Armentieres. Born 2 September 1891 in Leicester. In 1911 he was an Able Seaman living in lodgings at 15 Clove St, Chatham. His father was born in Leicester and was a shoe finisher, and his mother was born in Woolwich, Middlesex. He had three brothers, and in 1914 the family were living at 31 Farnham St, Humberstone Rd, Leicester. His ship was sunk by torpedo in the English Channel by a German U Boat with the loss of 35 officers and 512 men. Commemorated on the Chatham Naval Memorial. Born 1899 in Leicester. In 1911 he was still at school living at 35 Walnut St, Leicester. His father was a fruiterer born in St Albans, Herts, and his mother was born in Madingley, Cambridgeshire. He had two sisters and one brother. His ship was an armed boarding steamer which was sunk by a German U Boat in the Irish Sea west of the Isle of Man, with the loss of six officers and 95 ratings. Born April-June 1897 in Leicester, brother of Arthur Churchhouse so family details as above. In 1911 he was living at 35 Walnut St, Leicester and working as a printer. He may have been wounded during a major action by his regiment on 31st June 1917 in Ypres and died a month later, or during regular trench duty. Commemorated on the Ypres (Menin Gate) Memorial. Born Jan-March 1897 in Derby. In 1911 he was working as a clerk for a draper and living at 129 Firth Park Crescent, Sheffield. His father was a bricklayer born in Derby and his mother was born in Leicester. He had two brothers and two sisters. He enlisted in Leicester. He was killed in action during the Battle of Bullecourt 3rd May 1917. Buried at Bailleul Road East Cemetery, St Laurent-Blangy. Born Oct-Dec 1880 in Leicester. In 1911 he was working as a taxation officer for Middlesex County Council and living at 36 Duckett Rd, Haringey. His father was a brush manufacturer and both his father and mother were born in Leicester. He had five brothers and one sister. The family lived at 5 Freeman Cottages, Welford Rd, Leicester. He initially joined the 9th Battalion Middlesex regiment and on 29 September 1915 was commissioned 2nd Lieutenant and transferred to the 2nd/5th Battalion Lancashire Fusiliers in July 1916. He was killed in action by a sniper at Delville Wood during the Battle of the Somme. Born July –Sept 1892 in Leicester. In 1911 he was working as an apprentice draper and living at 22 Pocklington Walk, Leicester. His father, a draper employing others, was born in Heather, Leicestershire, and his mother was born in Worksop, Nottinghamshire. He enlisted on Sept 7 1914. He was killed in action during the Battle for the Hohenzollern Redoubt, which was the major action involving the 1/4 Battalion of the Leicestershire regiment during WW1. Born 1890 in Grimsby. In 1911 he was working as a clerk for his maternal uncle who was a baker and corn flour merchant and living at Northcote, Birstall Hill near Leicester. His father was born in Great Limber, Lincolnshire and was a railway passenger guard, and his mother was born in Caister, Lincolnshire. He had one brother, and the family lived at 260 Willingham St, Grimsby. Killed in action during the Battle for the Hohenzollern Redoubt. Born 1894 in Leicester. In 1911 he was working as a knife filer for boot machines and living at 30 Grasmere St, Leicester. His father was an elastic braider, born in Leicester, his mother was born in Bedford, and he had three brothers and eight sisters. He died during the Battle of the Aisne on 27th May 1918 when the Leicestershire Brigade were forced to retreat, although numerous rearguard stands were made. Buried at Hermonville Military Cemetery. Born 1892 in Sheffield. In 1911 he was living in Sheffield working as an iron moulders labourer for an iron foundry. His father was born in Leicester and was first of all a framework knitter working in Albion St and then a hosiery hand (porter). His mother was born in Leicester and worked as a worsted reeler. He had four brothers and three sisters. He died in action during the retreat across Belgium by British troops. Born Jan-March 1894 in Leicester. Brother of Fred Harriman so family details as above. In 1911 he was working as a needle maker and living at 44 Napier St, Leicester. Commemorated on the Le Touret Memorial. Born March 26 1894, in Leicester, baptised at Bishop St Methodist Church 6th May 1894. In 1911 he was living at home in Forest View, Victoria Park, Leicester – no profession was noted. His father was born in Kirdford, Sussex and worked as a draper. His mother was born in Tallington, Lincs. He had one sister. He possibly died of injuries received at the Battle of Frezenberg May 12/13, or subsequently. Commemorated at Leicester Welford Road Cemetery. Born Jan-March 1897 in Leicester. In 1911 he was working as an errand boy for a printer and was living at 90 Montague Rd, Leicester. His father was born in Great Glen, Leicester and worked as a builder’s labourer. His mother was born in Desborough, Northants. He had two brothers and three sisters. He was most likely wounded on January 13 during an attack against the Turks near the River Wadi during the Mesopotamian campaign of January – April 1916 and subsequently died. His brother Charles Newstead Jarvis who joined the 8th Battalion, Leicestershire Regiment was killed in action 3 May 1917 at Arras near the Hindenberg line. Born 26 October 1895 in Leicester. In 1911 he was working as an errand boy and living at 81 Asylum St, Leicester. His father was a cellarman and his mother a hosier, both born in Leicester. He had three brothers and two sisters. In 1914 he was living at 31 New Park St, Leicester. His ship was sunk by a torpedo fired from a German U boat off St Abbs Head, Berwickshire with the loss of 259 men. Born 1898 in Leicester. In 1911 he was still at school and living at 79 Conduit St, Leicester. His father was an assistant station master, born in Stroud, Kent, and his mother was born in Southwark, London. He had three sisters and one brother. In 1914 he was living at 49 St Stephen’s Rd, Leicester. In 1918 the Leicestershire Yeomanry were reformed and attached to other mounted units. Private Middleton was attached to the 4th Queen’s Own Hussars and would have taken part in the Battle of Moreuil Wood on 30th March. He is reported to have died of wounds at home in June, which may have been received in this action. Commemorated on the Brookwood (United Kingdom 1914-1918) Memorial. Born Jan-Feb 1890 in Great Dalby, Leicestershire. In 1911 he was working as a draper’s assistant and living at 64 Dalby St, Great Dalby. His father was born in Great Dalby and worked as an agricultural labourer. His mother was born in Barsby, Leicestershire. He had three sisters and two brothers. He was killed during a frontal attack on Turkish positions at Sannaiyat during the Mesopotamian campaign. Born Jan-March 1893 in Leicester. In 1911 he was working as a boot trade tacker and living at 2 Ruding St, Leicester. His father was a shoe hand finisher and his mother was a wool spinner, both were born in Leicester. He had three brothers and five sisters. He was most likely killed during the course of routine duty. Buried at Les Baraques Military Cemetery, Sangatte. Born Oct-Dec 1893 in Leicester. In 1911 he was at Leys School, Trumpington Rd, Cambridge and then at Peterhouse College, University of Cambridge. His father Arthur Wakerley, born in Melton Mowbray, was a prominent Leicester architect and Alderman and regular worshipper at Bishop St. His mother was born in Leicester, and he had five sisters, four of whom were baptised at Bishop St Methodist Church. In 1901 the family were living at 58 London Rd, Leicester and moved to Crown Hill, Gwendolen Rd in 1915. Arthur John became a Wesleyan local preacher, like his father, and planned to train for the ministry. He was commissioned and promoted to Lieutenant on 25 May 1915 and later became Captain. He was killed during a raid on enemy trenches near Lens in France. Buried at Loos British Cemetery. Born Oct-Dec 1895 in Leeds. In 1911 he was working as a printer and living at 19 Laxton St, Leicester. His father was born in Sunderland, Durham and was a printer and lithographer. His mother was born in Leeds. He had two brothers and one sister. The 11th Battalion was in action and sustained considerable casualties during 22-26 March 1918 in Ypres. Private Weir may have been wounded in this action or died in an isolated incident later on. Commemorated at Leicester (Welford Rd) Cemetery.